After a two-year development project including application at 15 utilities, the Smart Grid Investment Model (SGIM) is now available for application at all electric utilities. Turnkey Analysis: Let Consortium staff conduct your smart grid business case analysis using your utility and customer data with the industry's only comprehensive, quantitative cost/benefit model that applies utility-specific smart grid hourly load impacts. Stand-alone software application: If you prefer, the Consortium will implement the model using your utility and customer data, provide the software, and train your staff in its use including online coaching and applications support. "What-if" evaluations: The SGIM quantitative framework supports an unlimited number of technology, program and market scenario analysis ensuring a comprehensive consideration of all smart grid investment options in developing a smart grid strategy. Unprecedented scalability and continuity: The SGIM is scalable, designed to support utility smart grid investment analysis over a decade or more. Model add-in modules are designed to support extended analysis including substation/feeder level DA and volt/VAR analysis, distributed storage, electric vehicles, distributed energy resources and more. Continuous maintenance: The Consortium will maintain your SGIM indefinitely, ready to support renewed smart grid investment needs that arise from changes in technologies, and other factors. SGIM scalability and continuous maintenance provide unrivaled business case analysis at a fraction of the cost compared to traditional one-off approaches applied by most consulting firms. Cost of a full-service business case analysis is based on software, time and materials costs associated with individual utility applications. 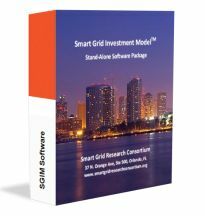 The Smart Grid Investment Model is now available as a stand-alone software package for application at all electric utilities. Consortium staff complete a basic Model implementation including incorporation of each utility's customer class monthly customer and kWh sales data, 8,760 hourly systems load data, monthly heating and cooling degree days and other information that you provide. Each model is calibrated to utility-specific data including estimation of a monthly customer-class end-use hourly load forecasting submodel to reflect impacts of technologies and programs on system loads, power costs, avoided future capacity requirements and other financial items. The model is delivered, online training sessions are conducted and Consortium staff are available to offer telephone support. The initial annual license fee for the Smart Grid Investment Model software for electric cooperatives, municipal and other public utilities is $9,500 with annual software maintenance and support fees of $3,500 thereafter. An additional implementation fee covers the cost of data processing, model parameter estimation and model validation. Pricing for investor owned utilities and other organizations is provided on request. An optional extended-detail distribution system model component includes individual substation, transformer, and feeder-level detail providing additional detail on distribution automation, Volt/VAR control, conservation voltage reduction, customer reliability valuations, cost-minimizing distribution system upgrade strategies and more. The license fee for this optional component depends on each utility's distribution architecture. The SGRC is an independent, objective research and applications organization initiated at Texas A&M University in 2010 to assist utilities with smart grid investment analysis. The Consortium was established as an independent research organization in January 2011 with headquarters in Orlando, Florida. The Consortium's Smart Grid Investment Model (SGIM), which began as a research and service project at Texas A&M University in 2010, has been developed over two years and been vetted through application at 15 diverse utilities. The Model provides a comprehensive financial analysis framework ensuring that all aspects of smart grid costs and benefits are considered. 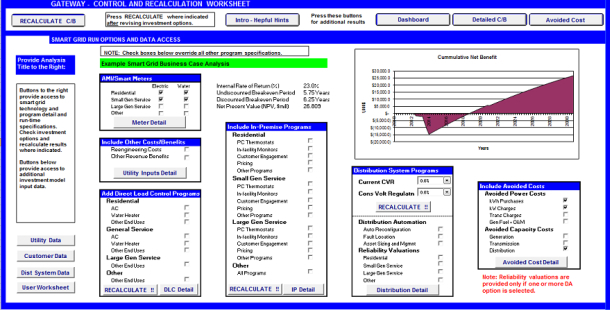 Each model application incorporates current individual utility line-item costs and infrastructure characteristics as well as monthly customer-class end-use hourly load submodels required to determine the impacts of technologies and programs on system loads and power costs. "Real-world" factors including management reengineering costs, delayed program benefits, etc. View a 5-Minute Video Overview of the Smart Grid Investment Model. More on the Smart Grid Investment Model. The Model user interface, graphic and tabular results worksheets have been designed with input from utility members so the model is easy to apply to answer "what-if" questions that arise (although Consortium staff are also available to provide this support). The screen shots below illustrate several worksheets in the model workbook. Each smart grid option can be evaluated by checking the appropriate box on the GATEWAY worksheet. In addition to providing access to all smart grid programs and program parameters, the GATEWAY worksheet provides selected summary cost/benefit analysis results including internal rate of return (IRR), undiscounted breakeven period, discounted breakeven period and net present value (NPV). 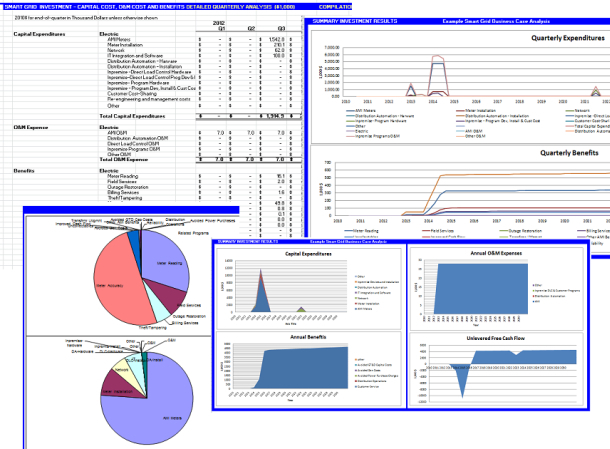 Detailed cost/benefit analysis results are presented in the DASHBOARD, C-B Results and other worksheets, some of which are shown at the right. More on the Smart Grid Investment Model business case analysis. Is A Consortium Business Case Analysis Appropriate for Your Utility? The SGRC provides exceptional value regardless of the stage of your smart grid development. Our members range from utilities who have yet to embark on smart grid investments to utilities on the leading edge of smart grid implementation. Applications range from evaluating and developing an initial smart grid development strategy, to evaluating "next step" extensions in smart grid implementations and to assessing and evaluating overall "after-the-fact" investment costs and benefits. Waiting to consider smart grid options: Most utilities are waiting before committing to a comprehensive smart grid investment initiative. The Smart Grid Investment Model provides a perfect evaluation and planning tool for these utilities as they consider alternative investment strategies to fit their particular utility/customer circumstances. Undertaking pilot programs: As utilities move into the pilot stage, the evaluation/planning framework provided by the Smart Grid Investment Model supports application of pilot results to full service area projections required to determine benefits and costs associated with individual and combination technologies and programs. Developing a Smart Grid Strategy: With information from pilots, vendors or internal analysis, utility planners develop a more informed view of smart grid benefits and costs required to identify technologies and programs that best meet their utility and customer characteristics. The Smart Grid Investment Model supports financial evaluations utilizing these data in what-if analysis to develop smart grid strategies appropriate for utility, customer and financial requirements. Smart Grid Investments Initiated: After initiating smart grid investments, utilities can benefit from continuous evaluations of investment activities monitoring costs and benefits and evaluating alternatives that exist in remaining build-out activities. The Smart Grid Investment Model provides a detailed framework for this analysis. Smart Grid Systems in Place: Achieving a smart grid is a continuing process that requires monitoring current systems and programs, evaluating new technologies and program options and benchmarking results to those of comparable utilities. The Smart Grid Investment Model provides these monitoring, evaluation and comparison capabilities. The Consortium is managed and its research is led by Dr. Jerry Jackson, an energy economist with more than thirty years experience in new energy technology market analysis, financial model development, utility program development and project management. He was previously a professor at Texas A&M University (where he led the Consortium through its first year), chief of the Applied Research Division at Georgia Tech Research Institute, and president of a consulting firm where he has worked with utilities, state regulatory agencies, equipment manufactures and others in addressing energy industry issues.